According to Shane, these stone curlews blend into the background rather well. They also stay still when people are close. Consequently, most folks just walk by without spotting them. 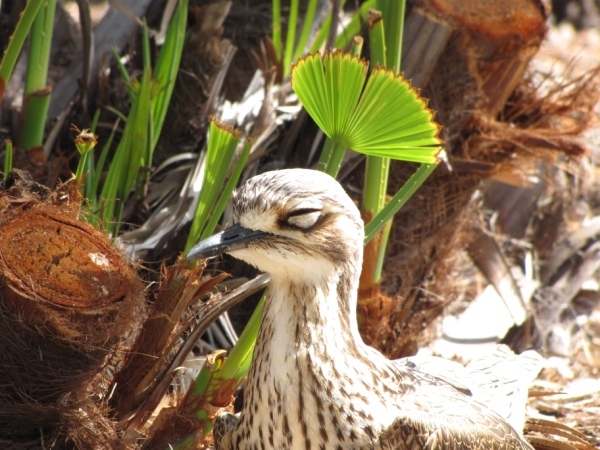 Bush Stone Curlews are mostly nocturnal, which explains the closed eyes in the photo above. 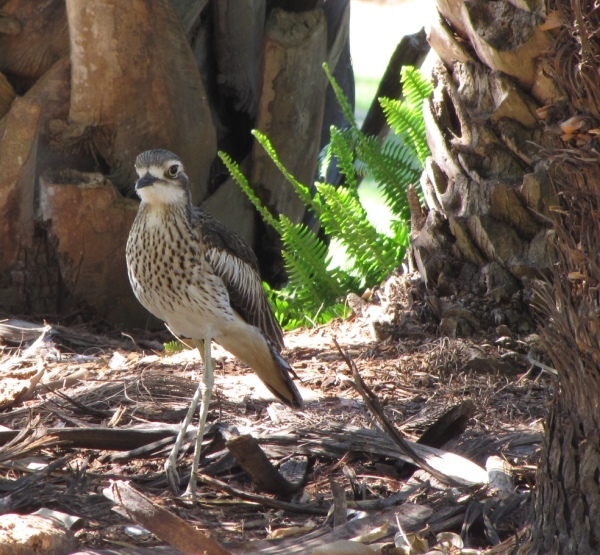 The next shot should clear up where the nickname “thick-knee” comes from. 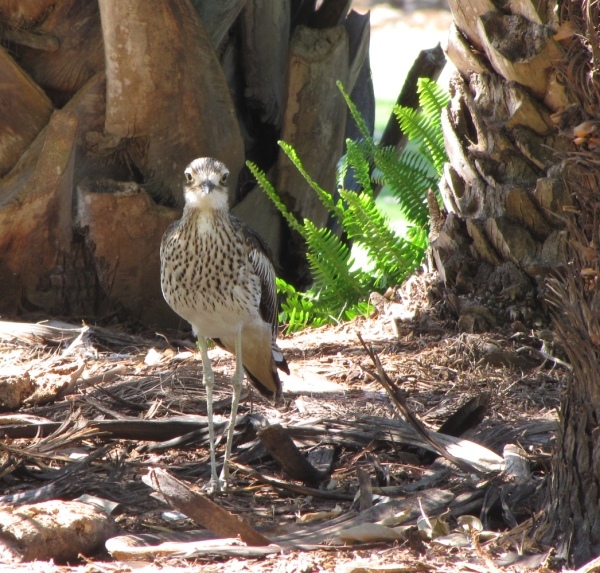 In fact, Bush Stone Curlews (Burhinus grallarius) belong to the family Burhinidae, which includes various and sundry Stone-curlews and Thick-knees around the world. Note that the Stone Curlew is not a true curlew like the birds in the genus Numenius. Shane notes that their loud calls at night sound more like women screaming than melodious birds. Then again, these are shorebirds, not songbirds! Many thanks, Shane, for these gorgeous photos and the permission to share them! 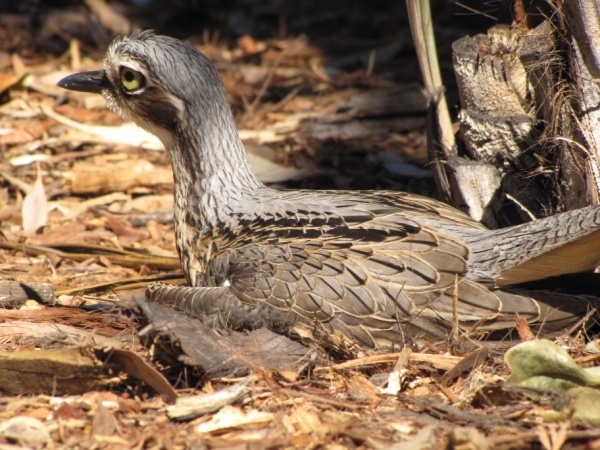 Wonderfuls photos and info on the Bush Stone Curlew. Most likely it will be a bird I will never see so thanks Shane for sharing. The feather patterns in that last shot… fantastic! I love this family. Mike, Mike, Mike… at first I thought you were Charlie what with the Old World bias… they’re called Thick-knees here in the New World too! Nick, I know that birds of this genus are called thick-knees all over the world. 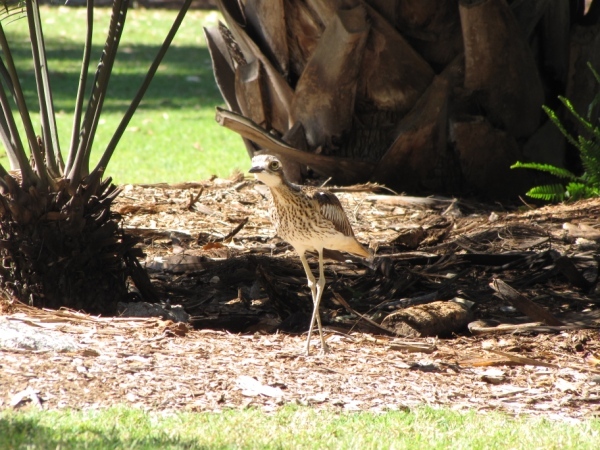 My point is that this particular thick-knee’s proper name is Bush Stone Curlew! Believe me, I’m New World all the way. Oh, my mistake: I assumed the species would now be called Obama Stone Curlew in the New World. How stupid of me. Had a look at your great photos. we have had a great experience on our small property with a curlew making a nest in our front yard,20 meters from the house and have been watching it for the past few weeks and they now have a small chick,Mother and father kurlew are very protective and hunt off any other bird that ventures two close. We think its absolutely marvelous. 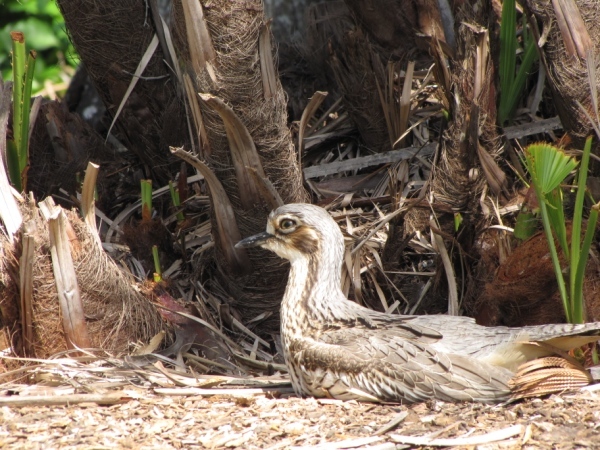 Currently I have Bush Stone Curlews (pair) nesting in my front yard in suburbia, and right out on open lawn. The eggs have been there since about the 11th January, I fear for the birds and eggs as the weather has been anything but kind lately. Can anybody tell me how long the incubation period is. Like the comment from Colin Barrett, I think it is fantastic and I want them all to survive. Gold Coasters can c a pair of these amazing birds cruising the car park & gardens of ur art centre off bundall rd. – enjoy !! Where Are You Birding This Fourth Weekend of June 2016?